A charming giraffe brooch by Birks sporting a jaunty cap and oversized sunglasses. The piece features 18-karat gold with black enamel patches. Although they may be diminutive in stature and composition, designs featuring a whimsical motif have broad appeal in jewellery, especially since they’re often the product of the creative minds and workshops of some of the finest makers. The same high-quality workmanship and material go into these pieces as in their more serious items. These charming designs are often created as brooches and pendants, sometimes as bracelets and rings, and more rarely, as earrings. Over the years, individuals can establish extensive collections of their favourite motif. Sometimes with expressive eyes and articulated body parts, whimsical jewellery often features an element of anthropomorphization to some degree, and it’s this attribution of human behaviour or emotion that’s so easy to identify with. Exaggerated shapes and dominant details are pleasantly connected to contribute to the essential charm, humour, and frivolity of each item. Often petite, these charming motifs can be multicoloured, vibrant, and stylized, rather than a true and accurate representation of any real creature or thing. The term ‘ludic’—meaning a playful quality—fittingly describes in auction catalogues and print advertising some adorable bit of cutesy nonsense, conveying a lightness of spirit legitimately worthy of appreciation. The prevalence of cute kittens and puppies on the web and in YouTube videos sweetly threaten to crash the Internet; T-shirts, mugs, cushions, slippers, calendars, and greeting cards surround us with a wonderfully unserious tone. The comical can also bring solace and catharsis to the world-weary soul like any good comedian; why shouldn’t a piece of whimsical jewellery do the same for both the wearer and the onlooker. Imagine a wildly imaginative puppy wheeling a unicycle, its pearl body accented with gold, a bicycle helmet on its tiny head complete with a sapphire headlight, although maybe a diamond would have been more practical! But that’s part of the point; the more outrageous, unusual, or unrealistic, the better to enhance the charm factor. Poodle double-clip brooches from the 1950s compete with a bulldog wearing a monocle and a white collar and bow tie. Call him Winston Churchill and you get the idea. The prominent American designer David Webb produced a veritable menagerie of animal motifs. A petite ‘lion ébouriffé’ brooch in 18-karat gold by Van Cleef & Arpels decorated with diamonds, emeralds, and black enamel. French jeweller Van Cleef & Arpels is very adept at animal motif jewellery. Consider a mischievous feline designed as a winking cat with an emerald eye topped by a curving graduated row of round diamonds, highlighted by a tiny ruby nose and chubby onyx cabochon belly. Its textured head and lush tail, polished ears, whiskers, and feet add contrast. It’s a charmer mounted in 18-karat gold. 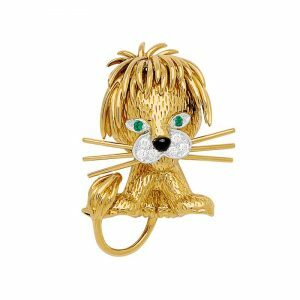 Amusement is guaranteed from the wildly popular lion ébouriffé series of pins, also from Van Cleef & Arpels. The tousle-haired lion was beloved by Grace Kelly and available in various sizes; like Goldilocks, one size is just right. Each seated lion is designed with a textured gold body and head, round emerald eyes, black enamel nose, and diamond-set muzzle. Its most eye-catching detail is the fabulous polished gold mane. Another French jeweller, Fred of Paris, designed an animal series including cats and dogs, some enhanced with black enamel or turquoise cabochon details. A perky brooch from Patek Philippe depicts a scampering chick with textured wings and feet, sparkling cabochon emerald eyes, and polished beak, its body and head pavé-set with ruby cabochons and diamonds. It’s got such a cute expression and a chubby body, slightly off balance so you just want to reach out and save it from tumbling over like a toddler learning to walk. Nesting birdies on another gold and diamond brooch from Van Cleef & Arpels ooze charm and sentiment, apparent in the smooching and loving glances of the parental unit admiring the soon-to-be nestlings. 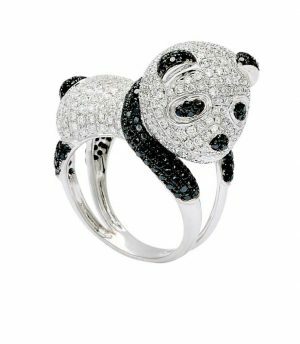 A baby panda pavé-set with white and black diamonds atop 18-karat white gold. The giraffe might not be the first animal that comes to mind when you think of an appropriate species translating well into jewellery, but prominent designers have frequently been inspired, perhaps by the exaggerated potential of such long legs and neck. A most charming novelty brooch from Birks is a whimsical giraffe wearing a cap and oversized green tinted sunglasses, the body decorated with black enamel patches. If you balanced it just right, the creature could actually stand on its spindly legs. A more demure version comes from Van Cleef & Arpels, and this time, the giraffe shyly peeks out from under half-closed eyes with prominent fluttery eyelashes. It is decorated with brown enamel patches and nose, round diamond ears, and black enamel eyelids with the applied lashes. The dominant head and neck are completely out of proportion with the almost unseen legs, yet it’s still so attractively unrealistic. 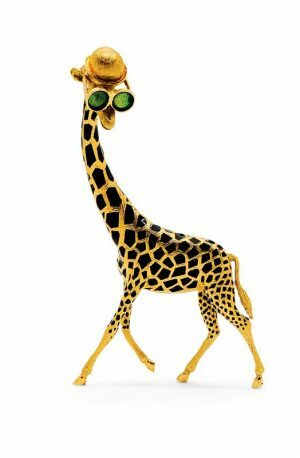 Fred of Paris also found inspiration in the giraffe’s elongated limbs and neck; his version is done in gold with black enamel markings and a comically bulbous nose. The pixies dance in tandem on a Cartier brooch, all set to hop, skip, and jump without a care in the world, expressions of joy on their tiny faces in the midst of their frolics, prompting smiles, their tiny sapphire eyes glittering. Their hinged heads and legs swivel and they sport fluted dresses and wildly windswept hair. Chopard excels with its jovial clown series of pendants; jaunty articulated limbs surround glazed compartments that jingle jangle with floating diamond bezels. Van Cleef & Arpels offers a brooch design reminiscent of a happy court jester or the joker on a pack of cards. 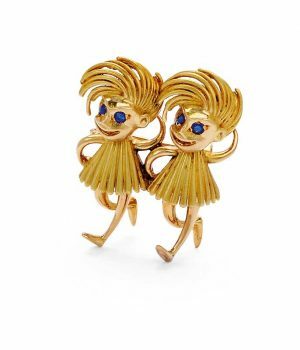 Twin dancing pixies brooch by Cartier in 18-karat gold and featuring tiny sapphire eyes. Everybody loves pandas, this time in a ring designed as a wee baby bear with contrasting white and black diamonds. From Van Cleef & Arpels, we can admire a petite pin fashioned as a bear cub, with pavé-set yellow sapphire body, pavé-set diamond head, emerald eyes, and black enamel nose. An adorable grouping of mice created from shapely pearls is more welcomed on a lapel than in the kitchen larder. Then there’s the ‘Disneyfication’ of luxury items, such as a pair of ear clips depicting a highly sculpted Mickey Mouse, or maybe it’s actually Minnie, with dangly hoop earrings and gemstone studs in its petite ears. Earrings wearing earrings! You have to smile at the thought of it. Escape from the serious and head to the frivolous. Impeccable sophistication abounds in petite treasures with cheerful motifs. Assure your clients they can charmingly harness the power of the whimsical to overcome negativity and bring a smile, a chuckle, and a grin.